Wilson Community College will be hosting a free seminar on First Alarm Strategy & Tactics. Complete the Sign-up Form to reserve your seat and receive registration information. General strategic goals and benchmarks for each structure will be discussed, along with supporting tactics for each. We will discuss engine, ladder, command, and rapid intervention considerations. We will discuss options and techniques for fire attack, searches, ventilation, and other issues — highlighting the factors to consider when searching each and formulating a decision-making process that officers can use to rapidly select the best applicable tactics for given conditions. 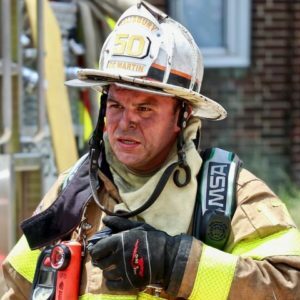 Nick Martin is presently a Battalion Chief with the City of Salisbury Fire Department in North Carolina. Previously he served as the Chief of Training for the City of Columbia, South Carolina and as a Lieutenant with the District of Columbia Fire Department. His career began in 1994 in his hometown of Swarthmore, PA. Since then Chief Martin has had the privilege to be surrounded by great, motivated firefighters who have taught him everything he knows. Chief Martin’s passion is for firefighting excellence, driven by the desire to provide uncompromisable excellent service to citizens. Since 2010 Chief Martin has had the privilege to present at FDIC as a classroom presenter and hands-on instructor with the Truck Company Essentials program. Since 2004, he has taught with Traditions Training, LLC* which gave him the opportunity to travel the country and share his thoughts, learn from others, and see many different ways of firefighting operations. Chief Martin has a BS in Fire Science from the University of Maryland and a MS in Public Safety Management from Johns Hopkins University. Chief Martin enjoys passing on the information, classroom and hands-on, that he has learned from his mentors and from good and bad experiences on the fireground. His goal is to pass on what was passed to him with the hopes of improving the skill and experiences of other firefighters. *Traditions Training, LLC was founded in 2002 by firefighters from the FDNY and Washington, DC area. Our founders saw a need to share the “street-smart” skills and knowledge learned from mentors their own years of firefighting experience. Today, we contribute that tradition through a group of experienced firefighters, fire officers, and chiefs from some of the nation’s business and most respected departments.